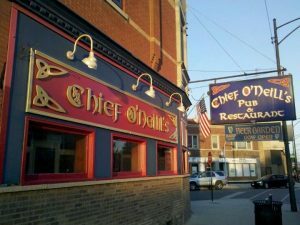 Chief O’Neill’s Irish Pub on Elston Ave, new home of The Craic radio show. Houlihan is the chairman and founder of Hibernian Transmedia, a public charity dedicated to Irish culture, and was looking to add another radio show to his trinity of weekly Irish American radio broadcasts. He’d been writing a column in The Irish American News for almost twenty years. He invited Geno on to The Skinny & Houli Show to talk about the Heritage Center, which Cooney had saved from the tyranny of a former Prez who’d taken the once proud arts organization screaming into the red along with a nest of vipers and paranoid pests who questioned the logic of every logical move. The two geniuses hit it off. Houli invited Geno to host a new radio show direct from the Heritage Center every Thursday night for broadcast on Saturday nights. They asked musician Kathleen Keane to co-host the show and she dubbed it “The Craic”. After a few dry runs in the solitude of the Fifth Province, the show debuted in December of 2015 and was almost immediately a hit, with its weekly infusion of live music to the pub and live session afterwards. Some of the ol’ spirit of the Heritage Center had returned, at least on Thursday nights. 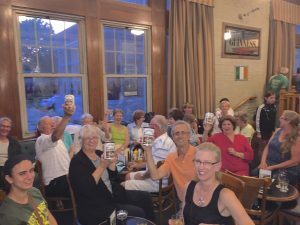 some of the “regulars” at The Craic showing off their oatmeal in the 5th Province. 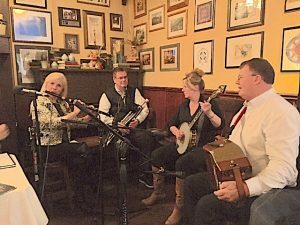 In fits and starts, The Craic put money in the cash register and smiles on the faces of pub patrons while showcasing some of Chicago and Ireland’s greatest living legends of Irish music. In August of 2016, Kathleen Keane left the show. But Houli and Geno said, “The show must go on!” And it did. 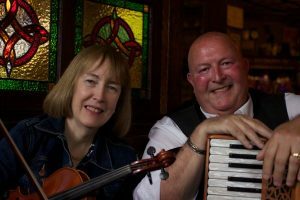 Almost every week for the next two years Geno and Houli trotted out their old jokes and wisecracks while introducing Chicagoland to some of the best talent in traditional Irish music from all over the world. They asked renown musician John Williams to start booking musicians and he brought a laconic wisdom to the show as he dubbed the Fifth Province Pub, “the Taj Mahal of Traditional Irish Music”. And so it was. 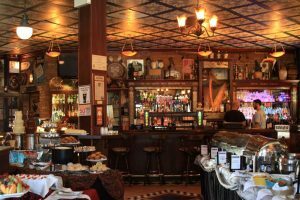 When Geno retired as President of the IAHC, an opportunity presented itself to move the show to nicer digs at Chief O’Neill’s Irish Pub and the lads were invited by Siobhan and Brendan McKinney to relocate The Craic to their very classy Irish pub, “the pub you’ve been practicing for”. The new format still includes all the great live entertainment, and the free raffle each week, but also the option for guests to enjoy an elegant dinner and hear the music up close, as well as a new special segment from “Matt the Mixologist”, as Matt the bartender showcases the weeks drinks specials. Or is that just another way for Geno and Houli to enjoy more booze? Whatever the case, it works! Siobhan & Brendan McKinney, Pauline Conneelly, and Gerry Carey. Devin Shepherd, John Williams, and many nights the proprietors of Chief O’Neill’s, Siobhan & Brendan McKinney, join in as well. Next Thursday Nov. 8th, will feature the one and only Jimmy Keane on The Craic! 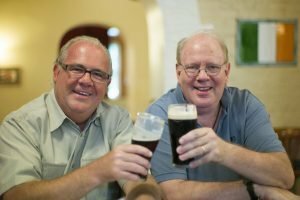 So “The Craic” abides and mightily, every Thursday night at Chief O’Neill’s Irish Pub, 3471 North Elston Ave in the Avondale neighborhood, starting at 7PM for one full hour of great music, laughs, delicious food and hearty drink. Please join us! There’s a free raffle every week and you never know what you could win, from gift certificates to complimentary McCann’s Irish Oatmeal! On Thursday December 6th Geno and Houli will be celebrating their official third anniversary of the show along with their Christmas party, so please stop by. Santa Claus might even be there! ← Movie Hooley kicks off with COVADONGA Friday night.